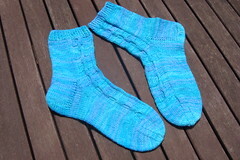 I've knitted my first pair of Sonja's socks Fluss des Lebens. Hope Lina will love them as much as I did knitting them. To tell you the trouth I've knitted one third sock - that's because I've made an error, I've added half a repeat of the "Zopf Muster", so I have to knit another left sock for Lina. Did I ever mention I hate frogging or re-knitting things? So, now, I have a single blue sock waiting for a friend..... and some yarn left. I'll knit a mišmaš for myself and knit a new pair of socks - with the same cotton blend but in pale blue and white colour - for my son. At this very moment I'm learning how to knit short rows heel flaps ( on two pair of socks ) and I've started my sock swap project. Something white, with beads and lace. Something I've never knitted before. I have only one regret - I did not accept to test a nice project from Unite contro il cancro. It was a small size, not adjustable, and I really don't have enough time to knit just for fun. Alas I have to wait another 10 years before I could retreat from work and start playing all for myself. I'm glad that I'm not the only one mad about socks!